In a Nutshell: People who develop money skills at a young age can avoid costly mistakes later in life. Luckily, many credit unions are putting members first and filling a financial literacy gap the public education system often doesn’t prioritize. Peoria, Illinois-based Citizens Equity First Credit Union is a good example, providing resources and hosting educational events for families and children in member communities. In addition to providing printed and online literature, CEFCU takes learning to the next level with personal finance simulations and youth accounts that give children hands-on experience with money. By exposing young people to financial topics early, CEFCU prepares them for stability and success as adolescents and adults. Megan Stimeling and Natalie Brandon are employees of Peoria, Illinois-based Citizens Equity First Credit Union (CEFCU). Stimeling is the Product Marketing Manager, and Brandon is a member of the Management Development Program, but you won’t always find them at a CEFCU branch location. 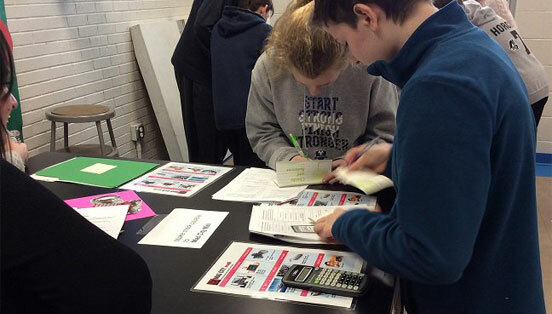 Often, you may find them at local schools participating in financial literacy events, like Mad City Money, a simulation designed to help students get hands-on experience with personal finance. That’s because CEFCU has pledged to serve communities in ways that extend beyond banking products and services. This presents CEFCU with the opportunity to teach children about money and help them learn good financial habits. To help the next generation enjoy future prosperity, CEFCU offers a range of resources and programs that help young people understand the importance of personal finance. This knowledge establishes a strong foundation for success that often endures the rest of their lives. Through CEFCU’s three youth accounts, children can develop financial literacy by managing their own money. Each of the three accounts, which are part of the Stones Program, is targeted at a different age group and includes a savings account, My Save Certificates, and mobile and online accessibility. Designed for children ages 3 to 12, Stepping Stone prioritizes saving money and learning smart financial habits. The second tier, Milestone, which is for teens up to age 15, comes with a free debit card that’s tied to a checking account. Finally, Capstone, which is for teens between ages 16 and 17, helps them transition into adulthood by introducing the concept of setting larger financial goals and includes access to student and vehicle loans. Account holders between ages 10 and 15 can participate in the Milestone Challenge each year. Participants must complete nine of 12 challenges, each of which teaches an aspect of financial literacy (like setting savings goals) and information about credit unions and how they differ from banks. Completing the Milestone Challenge earns the participant a $10 eGift Card. The program’s coordinators annually review and update these challenges. This ensures the Milestone Challenge’s content remains up to date and fresh for new and experienced participants alike, keeping them interested in learning and strengthening healthy financial habits. Another of CEFCU’s initiatives is an event called Mad City Money, which puts kids in the shoes of an adult with financial goals and responsibilities. Armed with this knowledge, students receive a profile that includes their career, salary, family situation, and additional expenses. To complete Mad City Money, students must visit a variety of stations that represent stores, businesses, and other institutions. “They have to stop at each station to make their purchase or pay their bills, and their goal is to end up with $100 in their checking account,” Brandon said. While these children have as much to learn about managing relationships as they do about managing money, Mad City Money is a hands-on, memorable experience for everyone involved. Students from a local school participate in a Mad City Money event with CEFCU representatives. Financial education can’t be all fun and games, though. Fortunately, CEFCU strives to provide informational resources that are just as entertaining and engaging to different age groups. One example is the workbooks CEFCU provides to schools in membership areas: “Saving with Mandy and Randy” and “Making the Right Money Moves.” The former caters to kids in kindergarten through second grade and includes exercises that teach students how to read statements, make deposits, and complete other basic financial tasks. By learning these lessons early, they’ll be able to start managing their money as adolescents and gain valuable experience for later in life. “’Making the Right Money Moves’ is geared toward the high school market,” Brandon said. This workbook covers credit, choosing a car and auto loan, making payments, budgeting, and other topics relevant to young adults. 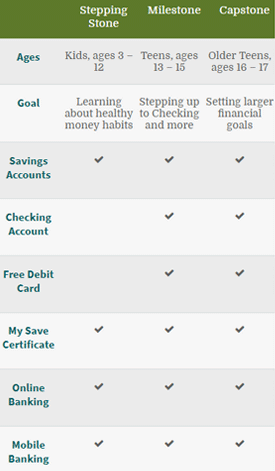 This helps high school students start thinking about their futures by understanding the financial decisions they’ll have to make after graduation. CEFCU offers other online financial literature, much of it through the Credit Union National Association. In collaboration with Brass Media, CEFCU also furnishes “The Money Side of Life” to its young members. “We also hold several financial literacy events at many local area schools yearly,” Stimeling said. By making this information accessible in print, online, and in person, CEFCU encourages students to continue their financial education using every available avenue. “The member centers organize their own events, so they might have a face painter and a balloon artist, or a bouncy house,” Stimeling said. Inviting the public to these events provides CEFCU with an opportunity to interact with parents and children, provide resources and education, and connect with community members.